When configuring a “child” list for Associated Items, there are two methods to link the children to the parents. The fist method involves the default SharePoint content type for Items/Documents/Tasks. The second method uses one of the custom Infowise content types, which were installed automatically along with the Associated Items feature. This section explains how to implement both content types as well as explaining when to use one type versus the other type. When you are converting a list with existing data to be a child list. Since the existing list items cannot be converted to the new content type, it is recommended to use the default content type. When you are creating items in both the parent and child lists using Infowise Actions and need to link the parent to the child automatically. In this use case, you must use the default content type since the automatic parent-child link cannot occur (note that this restriction is only true immediately following the automatic creation of the parent item, once the parent item has been created/saved manually, children can be automatically linked using these instructions). To use this method, all that is required form the child list is to have a lookup column pointing to the parent list. It is not necessary to use a specific field from the parent list, any field is appropriate, although it is best practice to use a unique parent field so it is clear which parent is linked on inspection. When using this content type, it is possible to link children to parents directly from the child list, simply choose the desired parent in the lookup list. Now when the parent item is viewed, the child item will be associated. Create a lookup field in the child list, pointing to the parent list. To use the Infowise associated content type, you must change the lists’ content type to the included “Infowise Associated” version. This is most easily done during the creation of the list, before new fields are added. 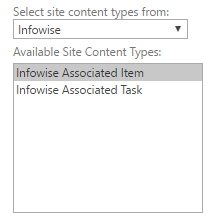 It is possible to convert an existing list to the Infowise content type, just be sure to include all of the existing fields in the Infowise content type. Here is an example video using this content type. When using this content type, it is not easy to change the association of a child item once it has been created. See the instructions here if you need to change the association. If necessary, turn on Content Type Management form the Advanced Settings for the List Settings of the child list. Select the “Item” content type. 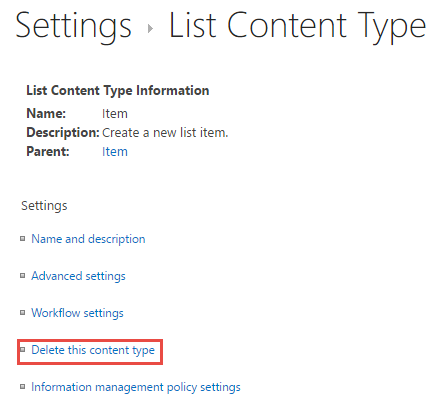 Select “Delete this content type” to remove the Item content type. 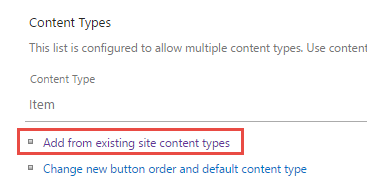 Click “Add from existing site content types” to open the content type management dialog. For a video example explaining how to implement the Infowise Content type, review the Associated Items Example: Products page.